Catalan politics differ markedly from the rest of Spain, a product of the strong Catalan national spirit that has seen a resurgence in the past three decades of democracy. Still, despite this deep-seated nationalism, less than a third of Catalans support full independence from Spain. In Barcelona, the beating heart of Catalan politics and economy, support is even lower. It is difficult to imagine Spain without Catalonia and impossible to imagine Catalonia without Barcelona. The leaders of the Socialist Party of Catalan (PSC), Republican Left of Catalan (ERC), and the Initiative for Catalonia Greens (ICV), the three-party coalition (Tripartite), which had governed Catalonia since 2003, agreed in principal 04 November 2006 to reprise their oft-fractious partnership and form the next autonomous regional government. Based on the election results of September 2015, there were seven different political parties or coalitions represented in the Parliament of Catalonia and the 135 seats are distributed as follows. The "Together for Yes" alliance won 62 of the 135 seats in parliament in September 2015, a victory that was seen as a huge step for the region, which has long sought independence from Madrid. In October 2015, the alliance filed a bill that would open the door to secession, prompting conservative Prime Minister Mariano Rajoy to issue a stern warning on television. Mas's government needed the support of the far-left CUP party, which won 10 seats in the elections. However, the CUP declined to back the leader, due largely to his austerity policies and various corruption scandals that have been linked to him. Catalan separatists struck an eleventh-hour deal 09 January 2016 to form a regional government that will work towards independence from Spain. The agreement required controversial secessionist leader Artur Mas to step aside. Carles Puigdemont was chosen to take over from Artur Mas as the Junts pel Si (Together for Yes) alliance's candidate to be regional government leader. Mas, who has presided over the regional government since 2010, said he was backing Puigdemont, mayor of the Catalan region of Girona, as his successor. Carles Puigdemont proceeded with the separatist course of his predecessor Artur Mas. A referendum on independence was already envisaged for November 9, 2014. The first question was "Do you want Catalonia to become a state?" In the case of an affirmative answer, the second question was posed: "Do you want this state to be independent?" However, the Constitutional Court suspended the vote. 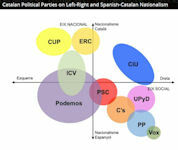 Substantial policy differences between the PSC and the PSOE emerged in 2008 as the Catalans refused to follow PSOE's sharp turn to the left. This new push to claim the center reflects the unusual electoral situation for the PSC, which does not battle for votes with the Popular Party of Catalonia (PPC), but with nationalist, center-right coalition Convergence and Union (CiU). At their party convention the Democratic Convergence of Catalonia (CDC), the majority party of CiU, emphasized a "big tent" form of nationalism that seeks to welcome the entire nationalist spectrum, from moderates who favor the status quo to those who favor outright independence. The Republican Left (ERC), the other independence party, one of PSC's coalition partners in the tripartite government (Govern), attempted to address why it has lost so many votes since 2006. The ultimate winner of a four-way presidential race ran on a "stay the course" platform, but with a bare plurality, new president Joan Puigcercos will not lead with a mandate and will have to carefully balance the demands of the ERC's partners and his intra-party critics. At its party congress in the summer of 2008, the Socialist Party of Catalonia (PSC), long accused by the nationalist parties of putting PSOE ahead of Catalonia, struck an independent tone from the Spanish Socialist Workers Party (PSOE) in hopes of shoring up support. On the ideological front, the PSC's centrist move was mainly intended to seize the center from CiU. In their platform, the PSC did not call for wider access to abortion, support for euthanasia, nor removal of religious symbols from official ceremonies and schools, which were all moves PSOE made just weeks before. However, this was not just a political move, as historically the PSC has had a less confrontational attitude with the Catholic Church in Catalonia than PSOE does with the wider Spanish Church. This difference is attributed to the close relationship the Catalan Socialists have with the progressive sections of the Catalan Church, which date back to the Franco era, as well as the overall reputation for moderation that the Catalan bishops have. Vowing that they would aggressively pursue a fairer financing scheme for Catalonia, the PSC seeks to neutralize one of CiU's most effective weapons against them. At the same time, however, the PSC realizes that they must balance demands from PSOE and Catalonia. Although the PSC is technically an independent party, it has sat with PSOE in the same parliamentary group in the Congress of Deputies. While some sections of the party seek for it to have its own group, the leadership realizes that this, and other 'separatist' actions can damage both parties. If PSC completely broke away, PSOE would have to form a Catalan federation of its own, the way it operates in the rest of Spain, and something it has not had since 1978. This would most likely lead to the defeat of both parties at the national and regional levels. The leftist, independence party, the ERC scored surprising electoral victories in the early part of the new century, enabling it to join the PSC-led coalition in the Govern in 2003 and 2006. Since then, however, the ERC suffered a large drop in votes, going from 8 seats to 3 in the Congress of Deputies after the March 2008 elections. After this defeat, party president, Josep Lluis Carod Rovira resigned that office, though he remained Vice President of the Generalitat. The internal struggle to replace him was a proxy battle over the future direction of a party seeking to regain its popularity. CDC, the majority party of CiU, focused on recovering the presidency of the Generalitat since they were unable to win a majority in 2006. CDC's convention in the summer of 2008 underlined a party strategy that will mostly continue its current policies with minor adjustments. Among these slight tweaks was the adoption of party leader Artur Mas's pet project of "the great house Catalan-ism" (la casa gran del catalanisme). It is an attempt to make the party appear more welcoming of the different strands of Catalan nationalism, thus trying to expand its electorate and regaining a majority in the Generalitat. The party's platform does not explicitly call for independence, though it does emphasize Catalonia's right to self-determination and vaguely foresees Catalonia as a free and sovereign state in 21st century Europe. In a perennial move, in 2008 the CDC reiterated its desire to completely merge with rightist Democratic Union of Catalonia (UDC) into a single party, which UDC, again, flatly refused. The PPC, the Popular Party's Catalan subsidiary, was plagued by the same problems faced by the national party: unpopular leaders pushing unpopular ideas. For example, party members arrived at their 2008 convention to find that national PP president, Mariano Rajoy, had unilaterally imposed a last-minute candidate for PPC president, Alicia Sanchez-Camacho, a senator from Girona. Rajoy also dispatched the new PP Secretary for Organization, Ana Mato to persuade the other candidates, bitter rivals Alberto Fernanez-Dmaz and Daniel Sirera to drop their bids. Still, a fourth candidate, Montserrat Nebrera, refused to end her candidacy, and in the final vote, lost to Sanchez-Camacho by a slim 53%-47% vote. Still, unpopular leaders were not the PPC's only obstacle to winning elections. In 2006, the PP opposed the Estatut for the complete opposite reason as the ERC; they claimed it gave too much autonomy to Catalonia. This is but one instance in which the PP was thought by most Catalans to be working against Catalonia's interests. In a region dominated by fervent nationalists, undermining Catalonia is hardly a winning strategy. If the entire goal of a political party is to win elections, the PPC has to drastically reform the way it does business if it ever hopes to govern Catalonia.